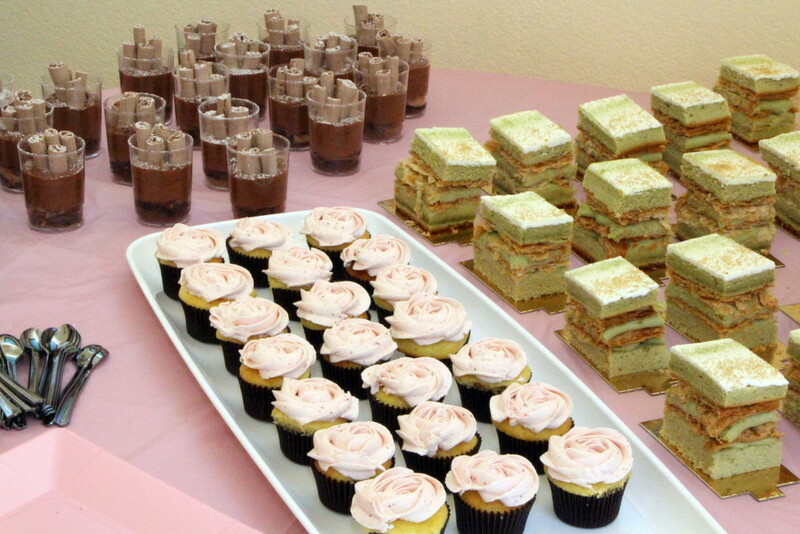 Baby Shower | Congrats Liang & Josh! 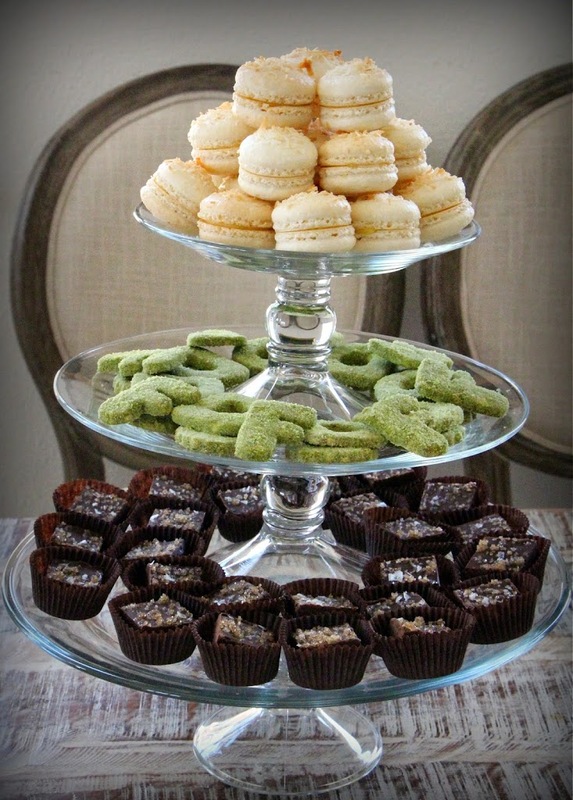 Baby “DoFo” (that’s a mashup of last name syllables) is on the way, and I was happy to bring desserts to the tea-time themed baby shower. 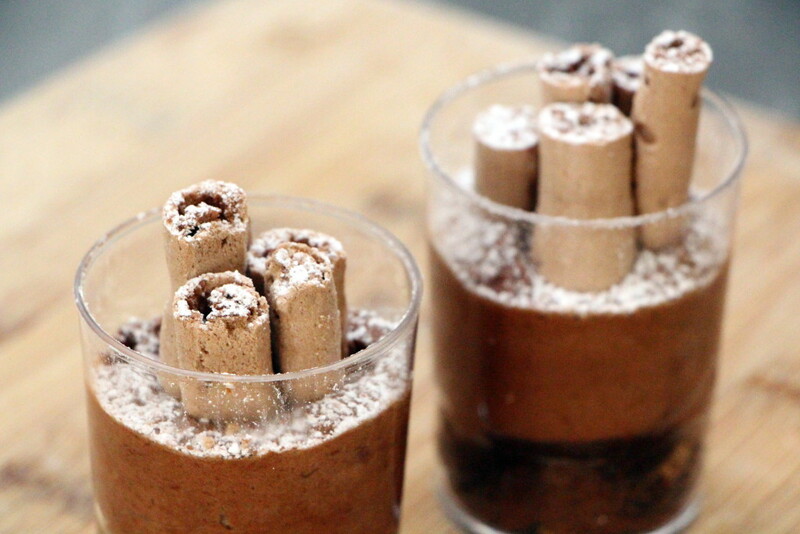 To match the theme, I wanted to make small bite-sized desserts that didn’t require any utensils to eat or serve. 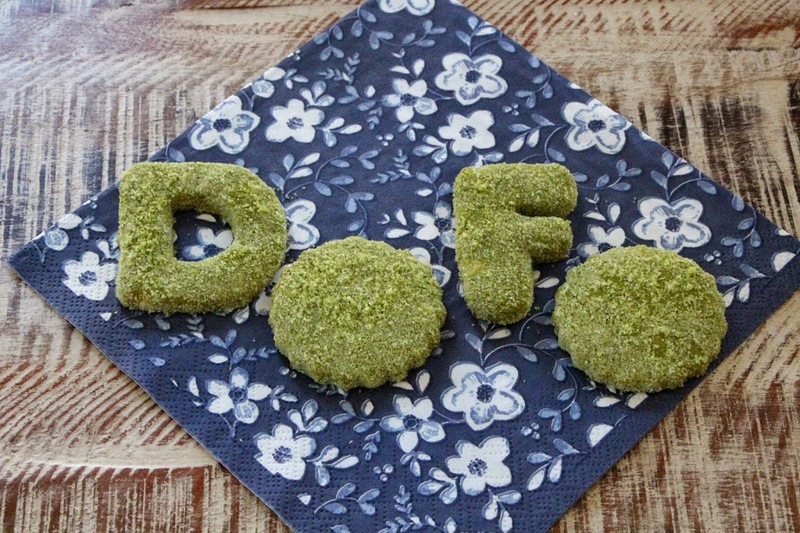 Another friend was already bringing scones, so I decided on coconut macarons with lime-lychee curd, matcha green tea sugar cookies (this time cut into D’s, F’s and circles — the ability to spell out DoFo was purely coincidental), and bourbon sugar fudge squares. 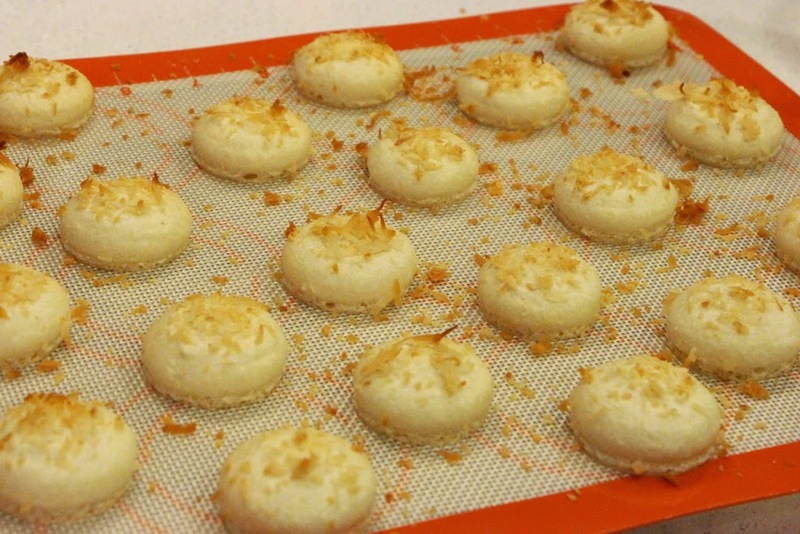 To make the macarons, I made plain shells but baked them with toasted coconut shavings on top. I probably could have ground up coconuts into the shell or used coconut extract, but I didn’t necessarily want the coconut flavor to be predominant. 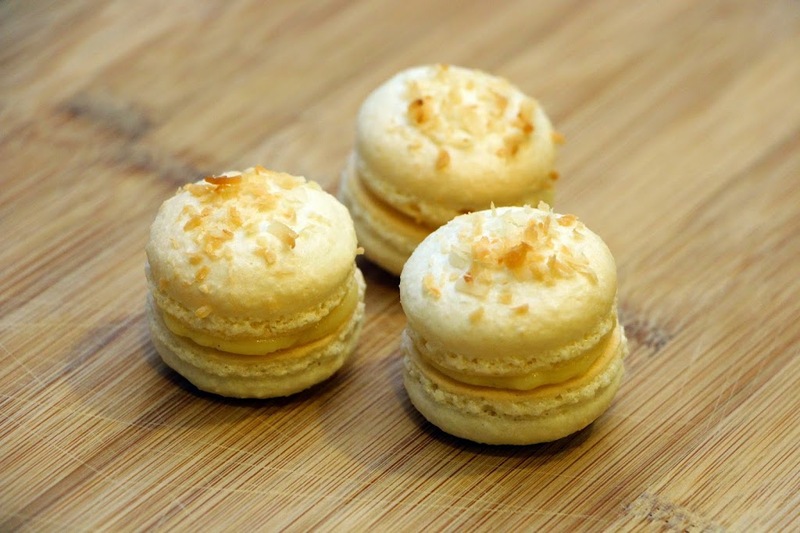 For the filling, I made lime-lychee curd (using a basic lemon curd recipe but substituting the lemon juice for about 75% lychee puree and 25% lime juice) and mixed it with a small portion of pastry cream. 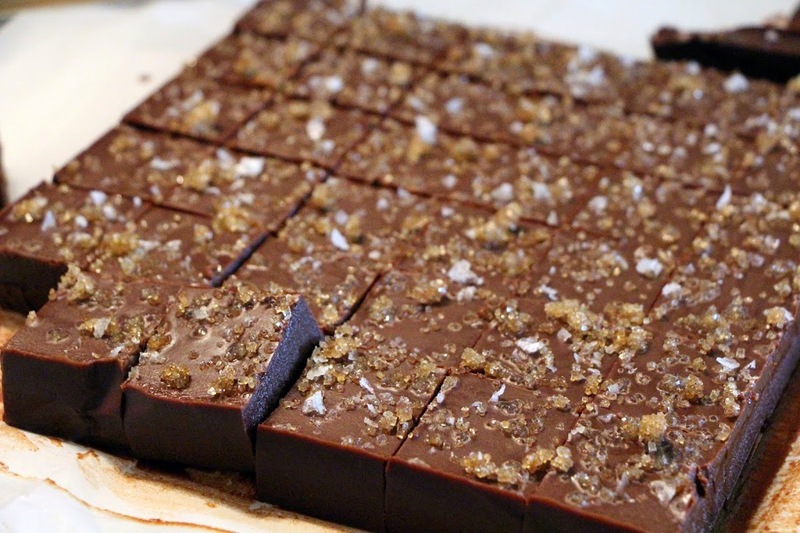 The fudge comes from a Bon Appétit recipe and is addicting. The original thought was just to throw in something darker and richer, like the pastry equivalent of a cigar for the men at the shower. But this ended up beingmy favorite of the three. 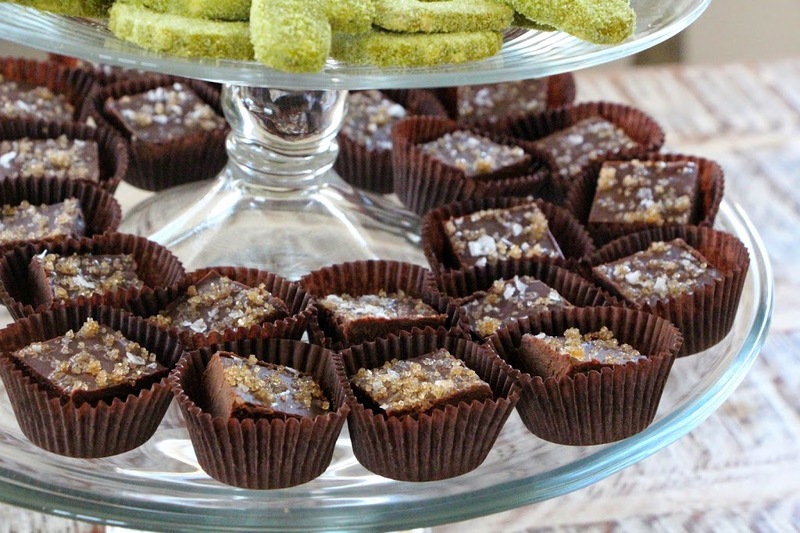 The fudge has a light bourbon flavoring in it, and is topped with bourbon raw sugar and Maldon sea salt flakes which really give this dessert that something special. 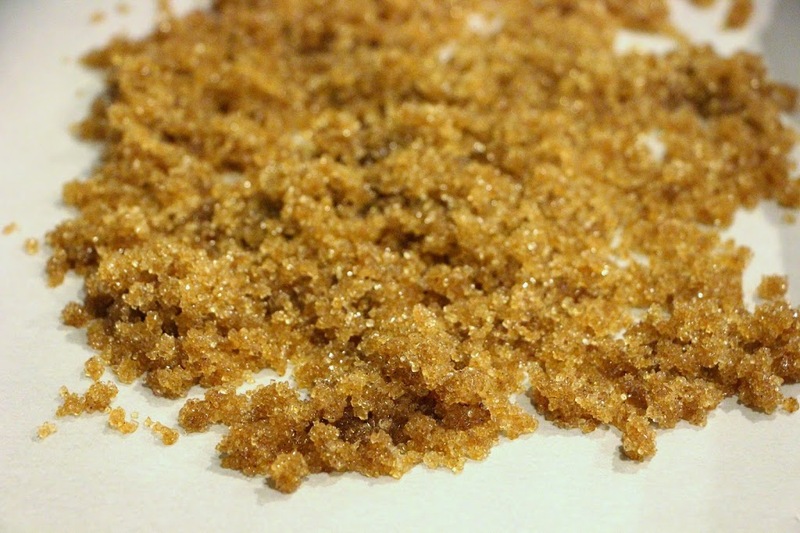 In advance, prepare bourbon sugar by scraping vanilla beans into a small bowl and stir in demerara sugar and bourbon. Spread on to a parchment-lined baking sheet and let dry out overnight (or speed up process by placing in oven at lowest heat possible. Line an 8″x8″ baking dish with parchment paper, leaving generous overhang to be able to pull out fudge later. 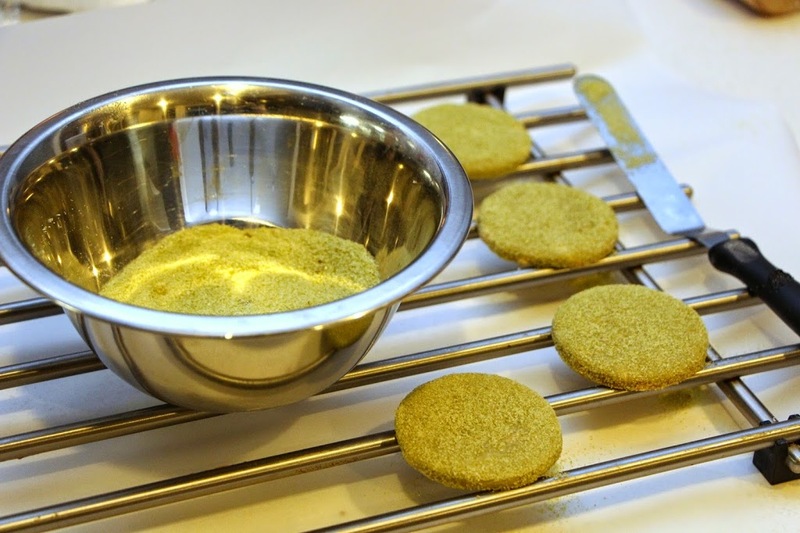 Lightly coat with butter or nonstick spray. 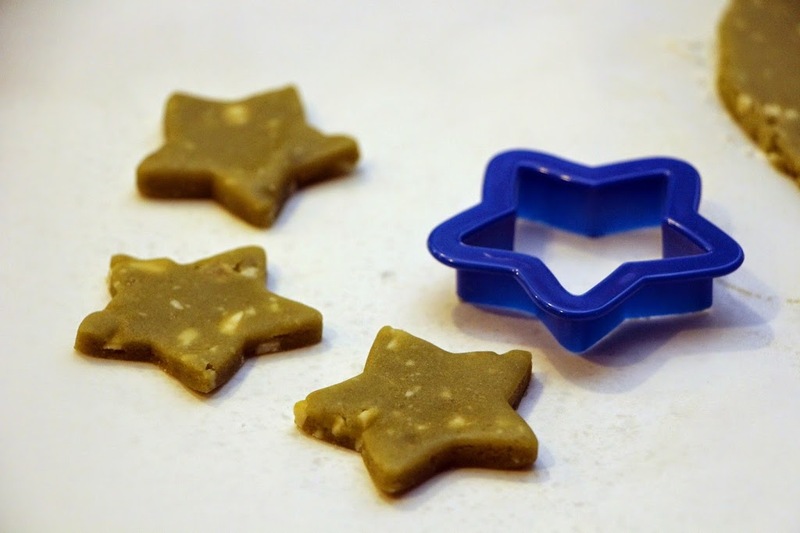 Heat chocolates in a double boiler (i.e. heatproof bowl set over a saucepan of simmering water), stirring occasionally until almost completely melted. Set aside. Combined condense milk, butter, bourbon, corn syrup, and salt in a small saucepan. Scrape in vanilla beans and heat over medium under barely hot (as close to same temperature as the chocolate). 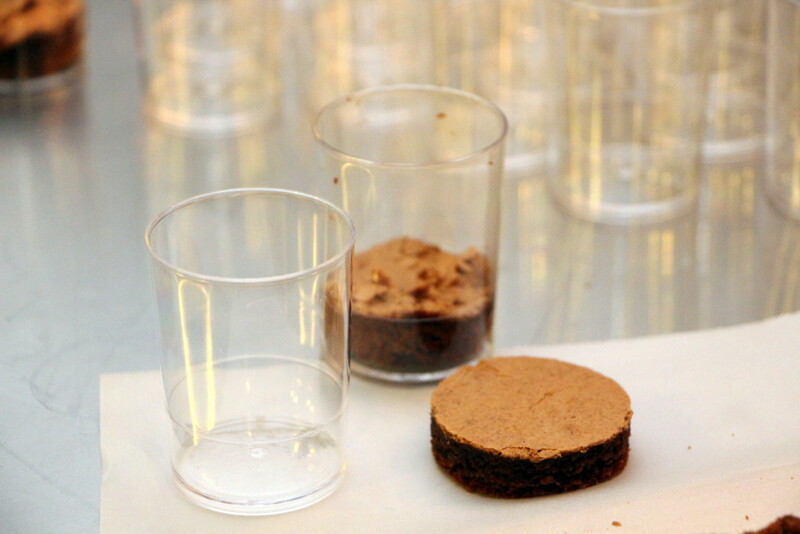 Gently stir in a quarter of the milk mixture into the chocolate with a rubber spatula. Add another quarter, stirring to incorporate. Continue mixing in the remainder of the milk in 2 additions, stirring vigorously until fudge is shiny and almost elastic, about 5 minutes. Scrape into the prepared pan and smooth top. Let cool before sprinkling with bourbon sugar and sea salt. Cover and chill at least 4 hours. Turn out onto cutting board and cut as desired. 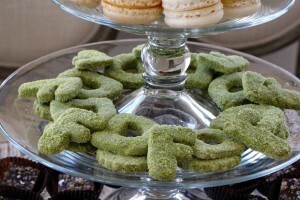 These might not be the right cultural reference, but they’re green and they’re tasty. 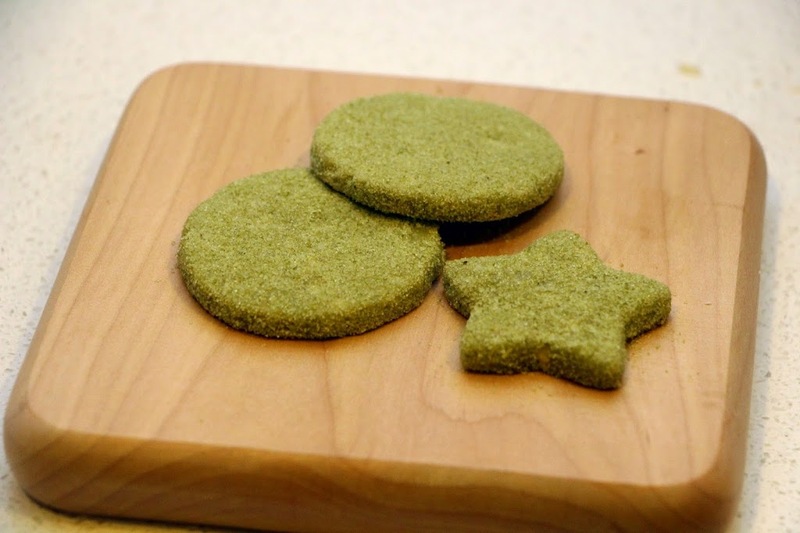 I was inspired by a Bon Appétit recipe, but when that particular recipe resulted in cookies that were more like tea cakes, I searched for a great rolled sugar cookie recipe that could be appropriately modified with matcha green tea powder. 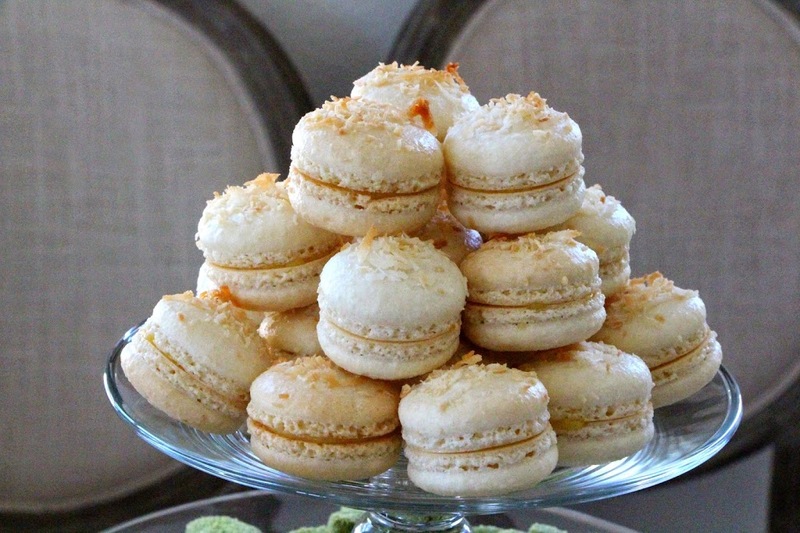 The chopped white chocolate and candied ginger are optional but add some depth in flavor. 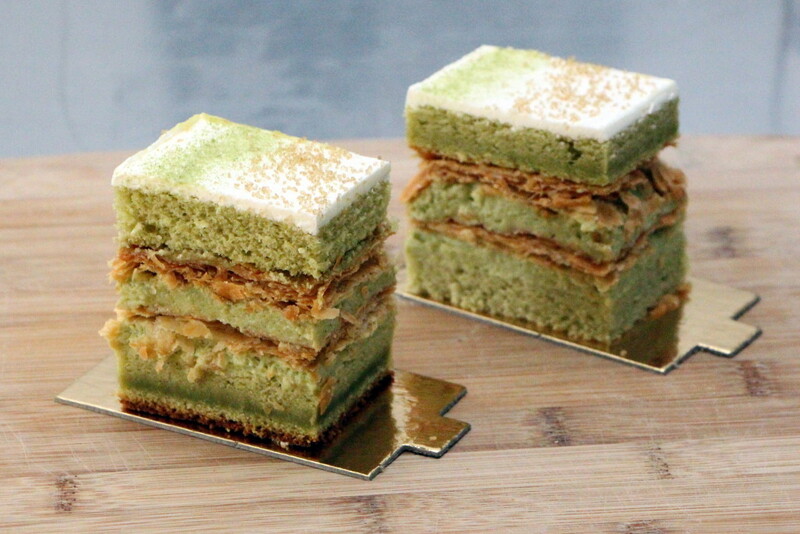 Whisk together the ½ cup of sugar and ½ tsp matcha in a small bowl and set aside. 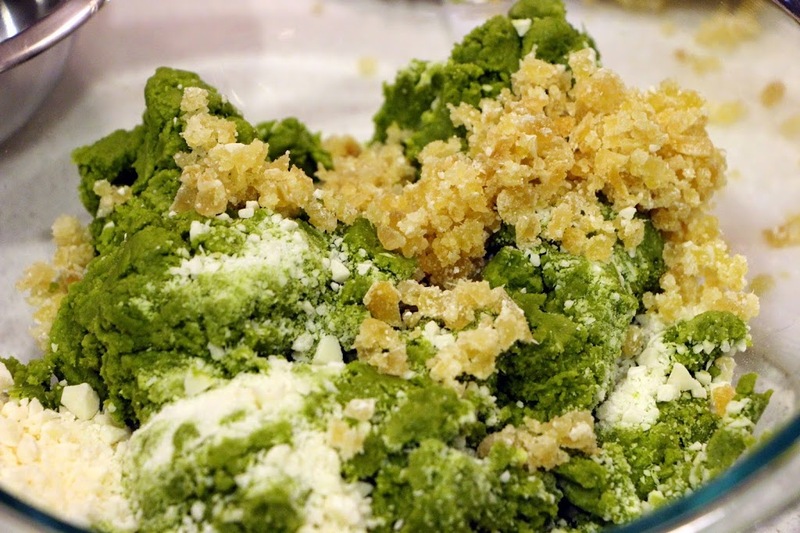 Whisk together the flour, 2 Tbsp matcha and baking powder in a medium bowl and set aside. Using a stand mixer, beat the butter until creamed. Add sugar and continuing beating until light and fluffy, scraping bowl as needed. Add egg and both extracts and continue beating until fully combined. Add half of flour mixture and beat until just barely combined. Add remainder and continue mixing until just combined. Fold in white chocolate and candied ginger. 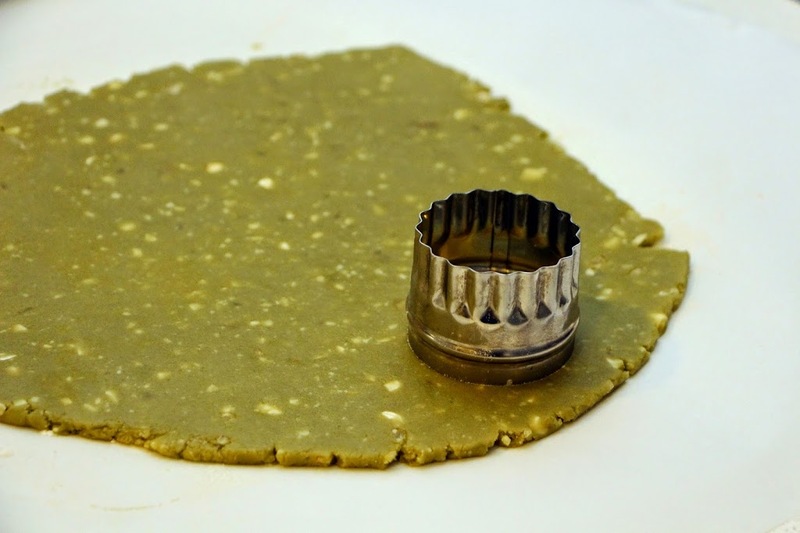 Flatten and wrap dough in plastic wrap, and chill for at least 1 hour. Roll out dough to ¼” thickness. Cut into desired shapes. Bake at 350 degrees for 8-10 minutes until just lightly colored around edges. 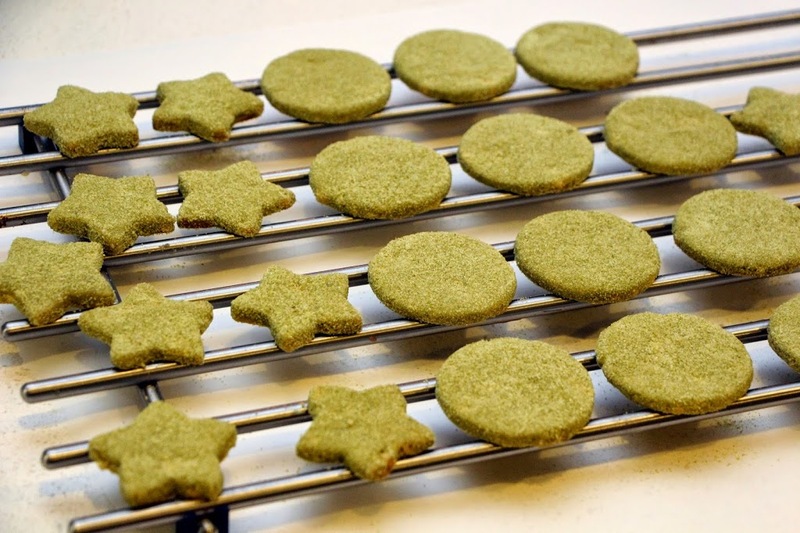 While still warm, toss cookies in matcha sugar mixture and set on cooling rack.